Does anyone know the level of carbohydrate, specifically starches, it takes to knock someone out of fat adaption? Also, would it take less fructose to do so? I like being fat adapted, and as such, am looking to find the threshold of added starch without losing the adaptation. why is it neither wise nor practical to eat zero carbs? i do it for days at a time, with other days just having a bit of cabbage and spinach with dinner. my brain runs BETTER, CLEARER, and moods are more even. And my ancestors hunted big game in Northern Europe, with a VERY short growing season for any fruit or berries. I think the above statement is the neolithic thinking, no offense. 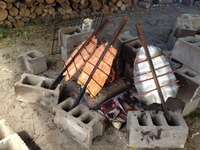 Yeah-- fruit is sweet, potatoes roast well over a fire. Instant blood glucose. "No potatoes" is tough to justify outside of weight loss reasons. I agree @Jackson that ketosis is a useful survival tool, and has become a useful weight loss tool. I can't imagine our ancestors shunning carbs though. VLC was obviously an ancestral diet occasionally; we evolved ketosis to get us by when times were scarce. Incidentally, this process can be manipulated to assist in body recomposition. There are lots of immediate and long term health befits to recomposing your body using this "hack." I don't think paleos lived on a VLC diet any more that they had to. The idea that we evolved to live in a VLC state is Neolithic thinking at its worst. Fad weight loss diet book rubbish. If you want to eat like a real paleo, gorge on what's ripe in season, and switch to meat when it's not. All of this discussion confirms a personal belief that VLC is not an ancestral diet. Since early humans ate opportunistically they would not have been in a perpetual keto state. The n=1's in this hack indicates that the keto state is difficult to establish even under highly controlled dietary conditions. Yes, our ancestors would have experienced it from time to time. But like Francis Parkman when he left the buffalo hunt, they would have gorged on carbs at the very first moment they were available. The brain can run on ketone bodies. Good catch Mike. borofergie- Lyle McDonald mentioned somewhere that once you keto diet, it's easier to become keto-adapted in shorter timeframes in the future. Anecdotally, this has been true for me. According to Phinney and Volek it takes 2-6 weeks to become keto-adapted. Phinney reckons that a single high carbohydrate meal is enough to kick you out of ketosis, so that you have to start the adaption process again (although he admits there is no scientfic data to back this up): http://www.youtube.com/watch?v=KkdFkPxxDG8 Mark Sissons says that he thinks that you can get back into a proper keto-adapted state within a few days. Any carbohydrates your brain needs (about 25g a day in ketosis) can be generated from protein and fat from a process called "gluconeogenesis". While it's neither wise or practical to eat zero carbs, you don't need to eat any to fuel your brain. Well, I'm operating under the assumption (could be dangerous, lol) that when I went VLC - less than 50g per day, that I had become fat adapted. I understood that as my body preferentially burns ketones over glucose. I'm trying to get the science aspect of this all down, so I apologize for the layman's terms / understanding of it all. How does one know if Leptin Sensitive? all based upon leptin sensitivity. If your sensitive any spike in insulin turns off fat burning until the second spike of insulin clears the blood stream 90-120 minutes later. Can you define "fat adaptation"? We all burn fat, no matter what our macronutrient intake is, unless we eat every couple hours even when sleeping. Fat is the primary fuel of resting or slow activity. Most people generate ketones at about 50 grams of carb or under. I personally feel an even energy level eating anywhere from 10-100 grams of carbs, perhaps due to infrequent and low amplitude insulin/sugar bumps. @ 25g your brain is burning about 25g of glucose, which comes from dietary carbohydrate with the rest of it's energy coming from ketones (most of your other cells are fuelled by free fatty acids). (most of your other cells are fuelled by free fatty acids). @100g+ your brain in burning 100g of glucose which comes from dietart carbohydrate, with any excess being stored (and used) in your muscles and liver. So technically, if you are eating less than 100g of carb a day, you are in ketosis to some degree. The difficult area is what happens in the 25g to 100g range where your brain is burning some glucose and some ketones. When people talk about being "kicked out of ketosis", I think they usually mean "no longer show any purple on ketostix", which usually occurs for most people if they eat more than 30-50g a day. I personally aim for about 30g, because it seems closer to a physical limit (25g) than 50g, which just seems a bit arbitrary. I think this is definitely one of those "everybody is different" because every body is different. My threshold is very, very low. Some are very high. I'm kicked out of ketosis at about 40g carbs. I rarely eat starch but even the smallest bit like half a small sweet potato does me in. I am hugely metabolically challenged though so hopefully your threshold will be much higher. You just have to play with it and see what your body's tolerance for starch and carbohydrate is. Just an heads up: ketosis is not simply a game resuting from carbs in carbs out equations. For example, the shot chain fatty acids present in Coconut oil, have the potencial to "deepen" the ketone body formation, even on the presence of carbs. The same goes for some aminoacids, such as lysine and leucine. Supplementing with both and introducing coconut oil can often induce a more ketogenic state even in the presence of a higher carb threshold. If you personally get kicked out of ketosis when go higher than 50gr, if the same level of CHO is assumed but incorporate coconut or leucine, you would be producing the same ketone bodies. Basically, we all can and do switch between burning fat and burning sugar. Some of us are better at it than others. As long as you're not eating lots of carbs all day long which would cause chronically high insulin, I wouldn't worry about it. If you've been paleo for a while and have things mostly dialed in, then you can trust your body and just go by how you look, feel, and perform. So just add carbs as long as you keep feeling good. Basically a carb is a carb. Simple sugar or complex it all breaks down to glucose fuel. Your question regarding fructose is interesting. Although it is metabolised differently I am not sure if there is a "net" carb effect from that or if a carb is a carb. Fructose is typically stored as fat and nor burned like glucose. I have not myself come across any science on fructose having a distict carb value but I am betting the storage as fat is a reason it is often recommended to eat very little of it. keto-adapted and primarily/preferentially using fat for fuel after 2-6 week adaptation stage is different than "some" fat burning- now and then-here and there. what shows on keto stix is excess unburned ketones during the adaptation stage. If you are showing ketones in urine you are not fully keto-adapted. In agreement with those who say it is an individual thing above 30-50g CHO. I did quite well around 70 or so on a broader diet-problem is you tend to just add this here and that there and before you know you are way over and out. I dont think its wise to be "fat adapted" for long periods. Maybe a few days a month but remember the brain needs carbs.